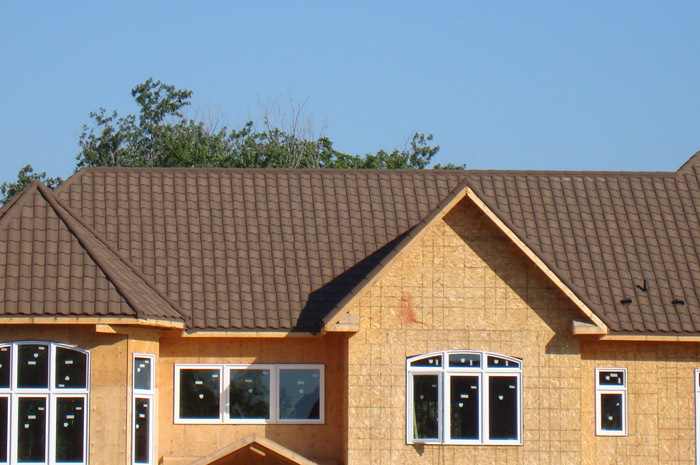 Whether you’re a do-it-yourself contractor looking to re-roof an existing structure or a developer building from the ground up, we have the expertise and assistance necessary to accurately assess the proper materials required plus installation costs for a competitive quote on your next roof job. 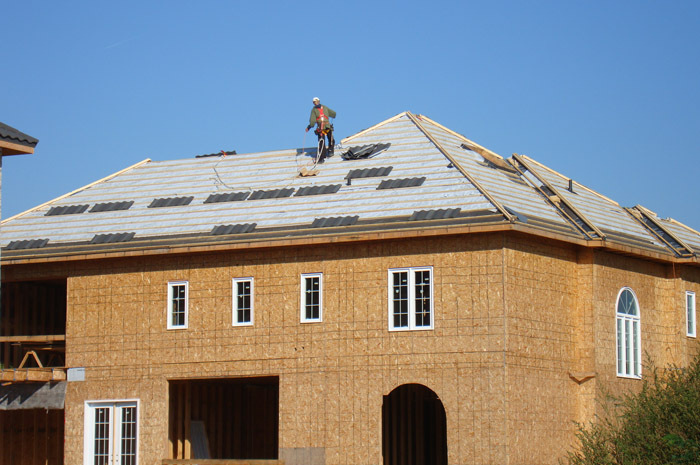 We will address your concerns on important topics such as roof pitch, ventilation, flashings, underlayment felts, roof membranes, fasteners, tools and finishing details. 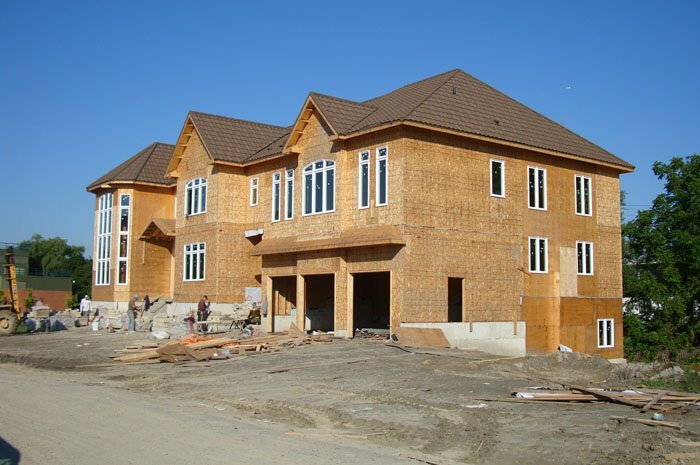 Please fill out the online form at Get a Quote or call our toll-free number so we can discuss the best way to get started on your commercial project. 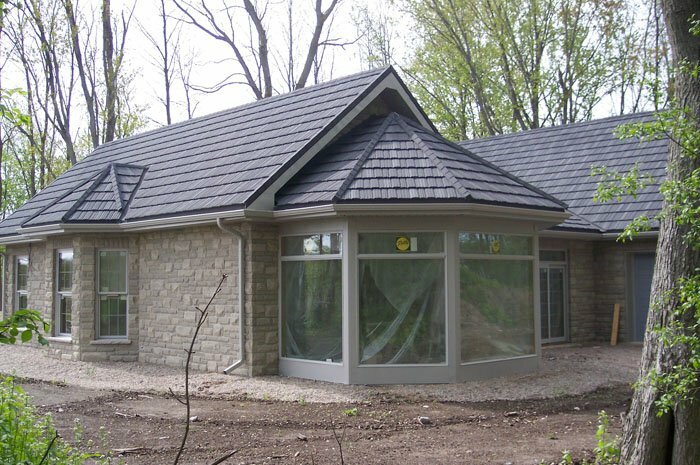 This beautiful fieldstone home in Ontario features a durable steel roof from Metal Roof Outlet – all it needs now is some nice landscaping to admire from those amazing windows! 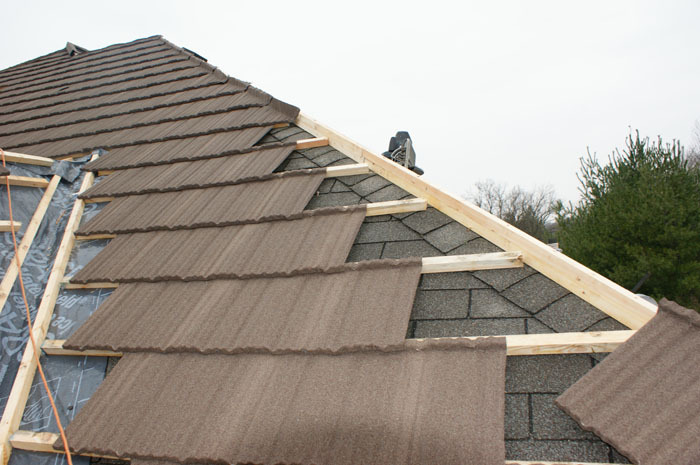 Here is another look at this beautiful, sloped roof that leads to a narrow turret. 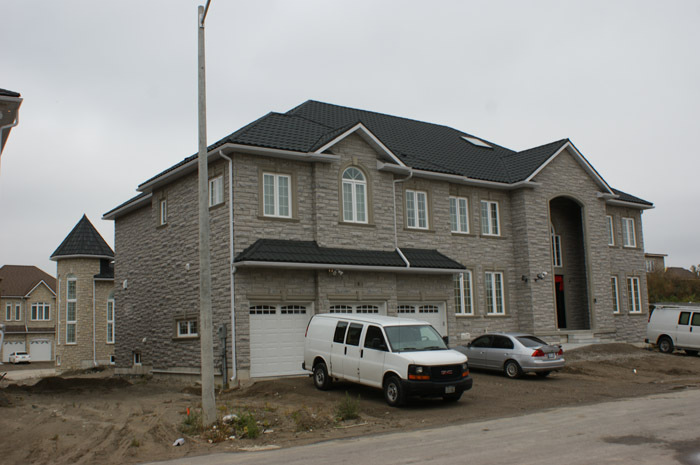 This impressive grey brick home added some visual interest to its façade with a rich steel continental tile from Metal Roof Outlet, Ontario. 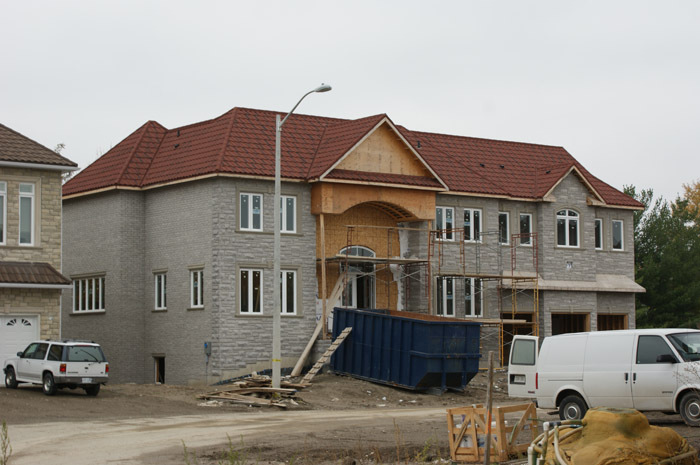 Here is another look at the steel continental tile on this Ontario home. 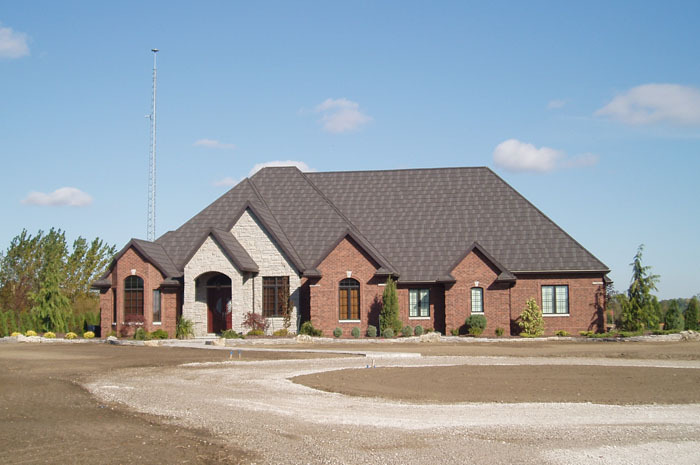 The contractor working on this secluded Ontario home knew they wanted a classic and natural look – which is why they chose fieldstone style brick and a steel shake roof from Metal Roof Outlet. 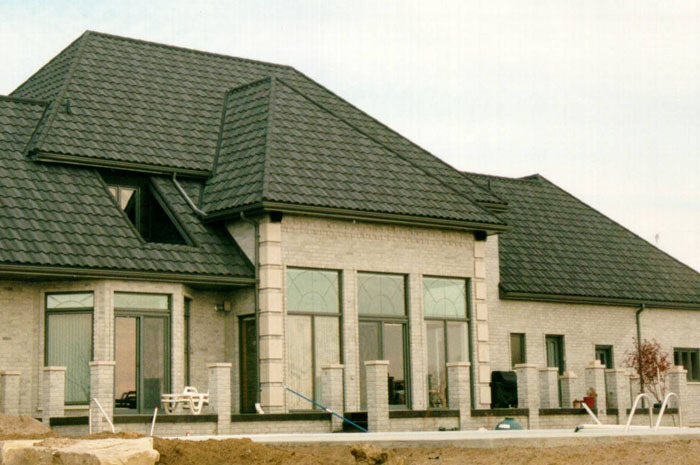 The steel continental tile roof on this Ontario home may be a work in progress, but the quality and beauty of this variegated terra cotta style product from Metal Roof Outlet is already evident. 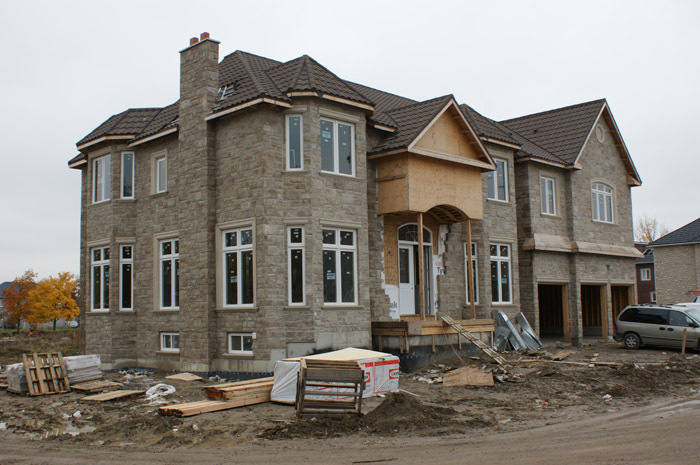 This Ontario contractor is building a home with a lot of classic features – red bricks, black shake – but the quality is evident in the stonework around the windows and doors, as well as the upgrade to steel shake from Metal Roof Outlet. Here is a closer look at that same traditional style – notice how Metal Roof Outlet’s installation has all of the style and charm of traditional shake, but with the strength of steel! This grand home features a three-car garage and a huge arched doorway, protected above by a high-quality steel continental tile roof from Metal Roof Outlet. 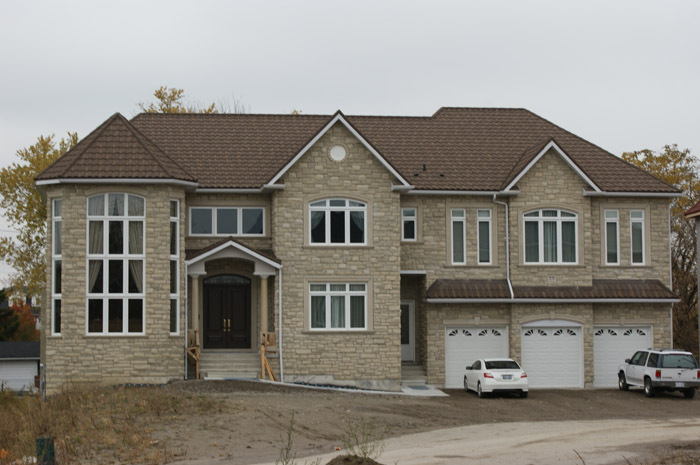 The contractors who built this gorgeous Ontario home wanted a traditional shake look without sacrificing quality – they chose Metal Roof Outlet’s gorgeous steel shake for style and longevity. 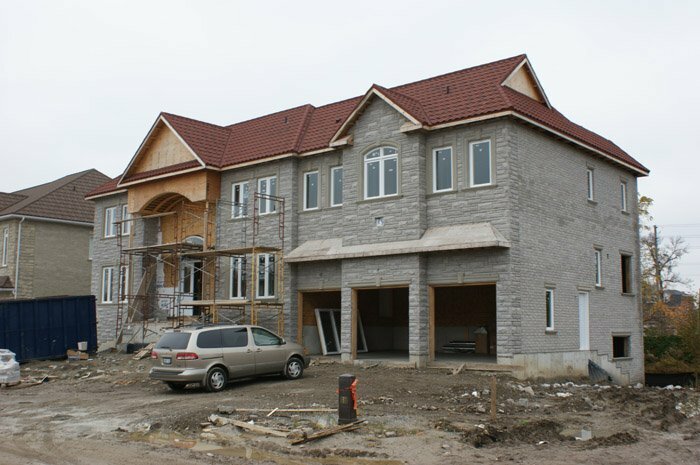 Take a closer look at the construction process – from top to bottom, this home is built to last with concrete walls and an extremely durable and gorgeous steel continental tile roof by Metal Roof Outlet, Ontario. 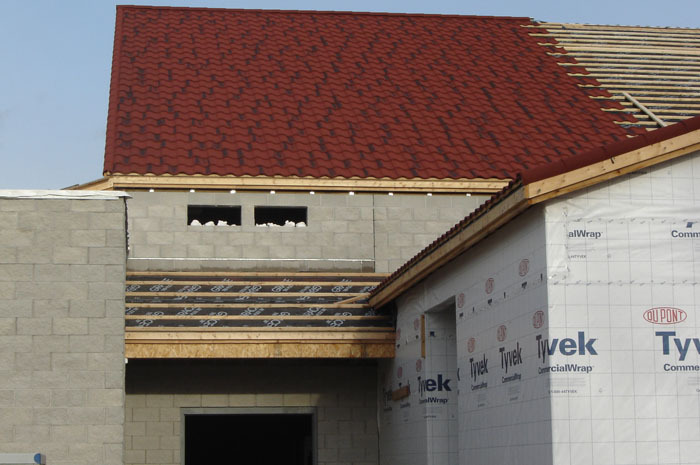 This Ontario contractor asked Metal Roof Outlet to be a part of their project, and even in the early stages of construction our dedicated installation team is ready to work. 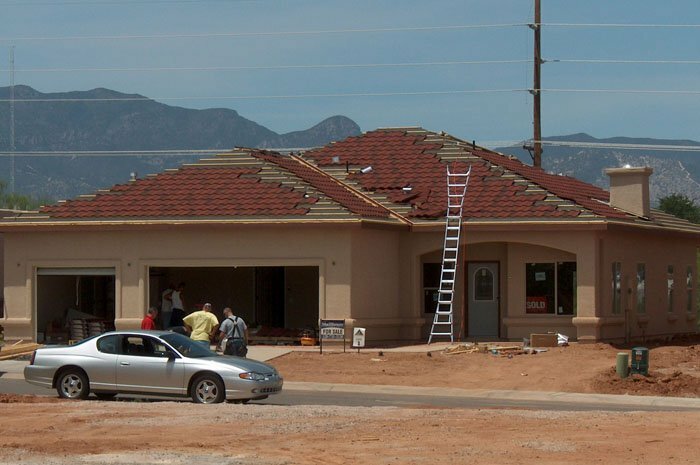 Here is another view of the same home, with its amazing new metal roof completely finished! 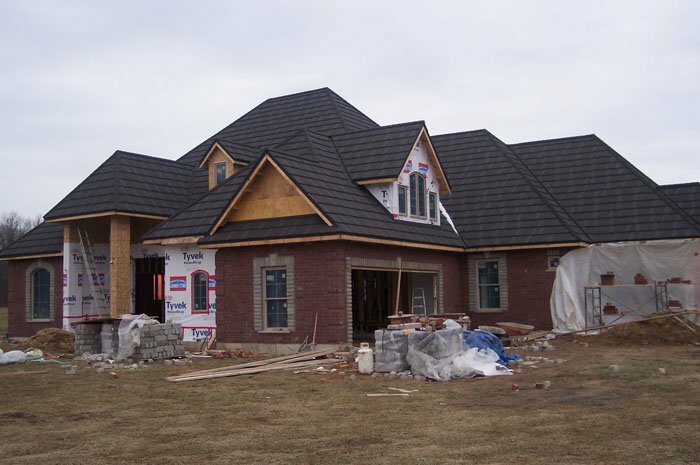 This work-in-progress home will be gorgeous when finished – with large new windows and a brown steel continental tile by Metal Roof Outlet, it is sure to impress. This is the same house, finished! The brown steel continental tile by Metal Roof Outlet is the perfect finish for this taupe field-stone style brick and subtly arched doors and windows. 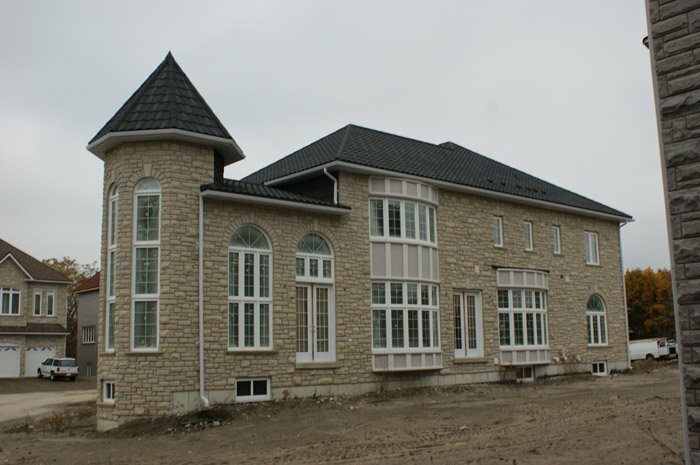 Here is another view of this beautifully finished home – notice that the gorgeous terra cotta tiles on the roof beside it are also Metal Roof Outlet’s work! 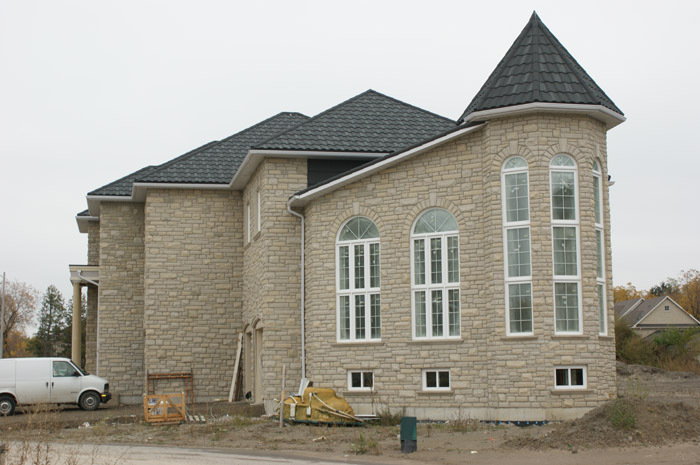 This gorgeous and stately Ontario home is protected from the elements by Metal Roof Outlet’s steel continental tile. 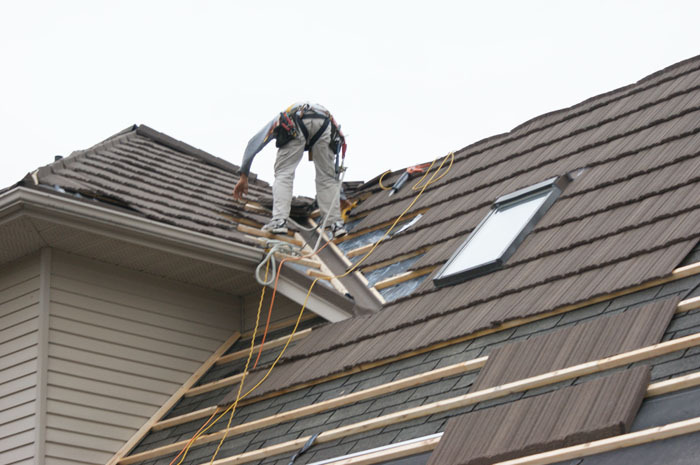 Notice how our expert installation team easily navigated the steep slopes, irregularities, and skylights! This lovely, custom farmhouse style home features a gorgeous covered porch, a peaked weathervane and bell tower, and a steel shake roof by Metal Roof Outlet, Ontario. Here is one of our incredible installation professionals carefully installing a steel shake roof. Notice that Metal Roof Outlet’s incredible products can easily be installed over existing rooofing for a low-maintenance renovation or build solution. Here is a closer look at the process of installing Metal Roof Outlet’s amazing steel shake product over an existing roof. 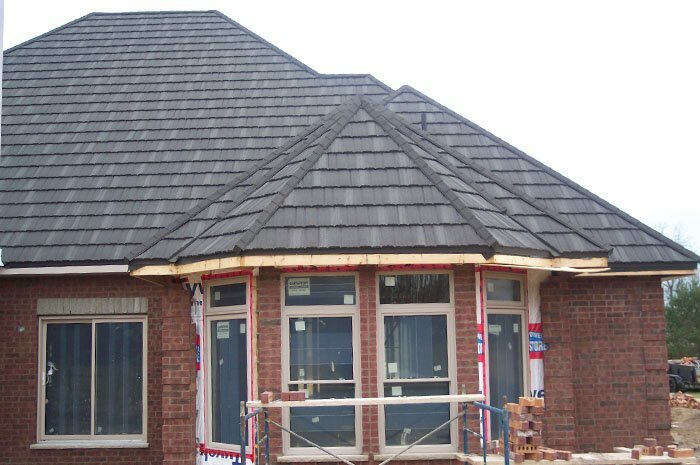 Contractors trust Metal Roof Outlet with difficult and custom jobs, like this many-peaked, steeply-sloped roof in Ontario. Our installation team produced amazing results with a classic charcoal steel shake look. 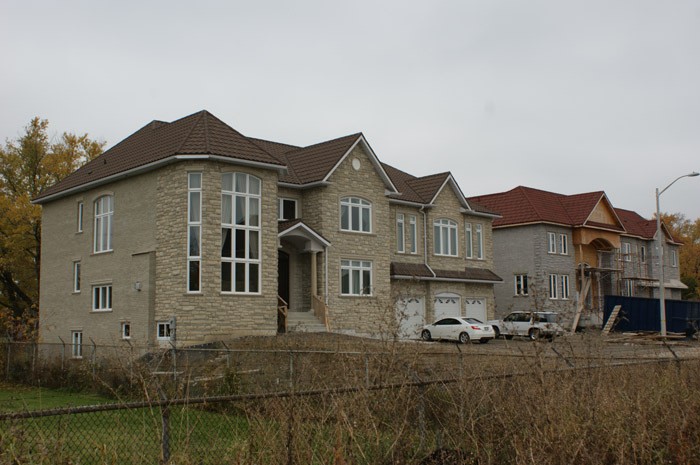 This two-story fieldstone home is topped with a beautiful and long-lasting brown steel continental tile by Metal Roof Outlet, Ontario. 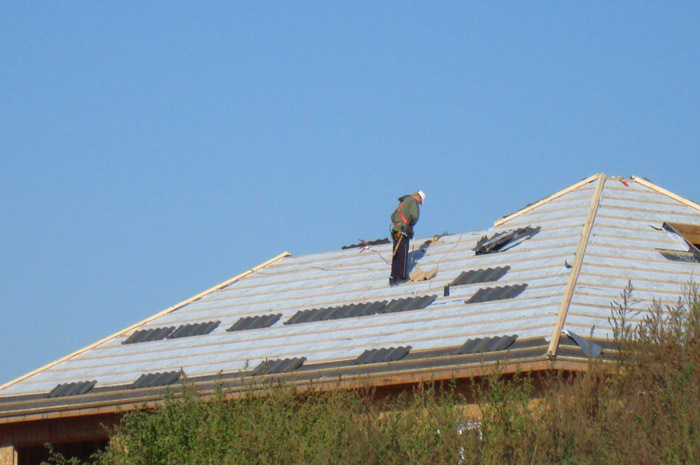 Here you can see one of Metal Roof Outlet’s dedicated installation experts working on an Ontario home.